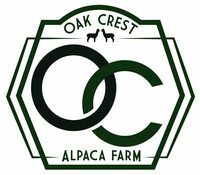 : Oak Crest Alpaca Farm is a farm located in Downs, Illinois owned by Harvey Harms. Our farm focus is to continually enhance our capabilities in breeding the next generation of alpacas with ideal fleece traits and superb conformation. We are very pleased with the genetically diverse foundation herd of first-rate huacaya females we have assembled or produced over our first few years. Along with great mentoring received, we appreciate and benefit from the advancements many of the long-tenured alpaca breeders have achieved and shared. As an indication of our progress, we were awarded the 2016 Futurity Rookie Breeder of the Year for Small Farms. More gratifying than imagined….. it is a daily pleasure to be involved in all aspects of breeding, birthing, raising and showing these exquisite animals. We are located in central Illinois and welcome your inquiries and new relationships. If you are an established farm, we may have some unique genetics to advance your program. If you are a prospective alpaca owner or new alpaca breeder, we would gladly share our experience to help you be successful with these alluring fleece animals. Give us a call/text at 309-830-1007.